Nell Whitby thought she knew all about her life until she moved to New Orleans after the tragic death of her parents. As she begins to uncover dangerous family secrets she also becomes a target for several assassins. She discovers that her parents have left her better prepared than she’d realized as she fights her way through the mysteries surrounding her. Pauline Baird Jones has written an exciting mystery with a sweet and gentle romance. The story is set in New Orleans and Jones brings that city to life with such vividness that the city itself also becomes a character. I have never been to New Orleans but now I feel as if I have. Nell is a wonderful quirky heroine, a fully three-dimensional person whom it is easy to like and champion. When Nell foils a carjacking by riding her bicycle into a car door, she meets detective Alex Baker and the two are immediately attracted to each other. Alex is also a well-developed character with his own set of quirks, including being the eldest of thirteen children. Nell and Alex dance around each other as they attempt to foil the New Orleans mob families. The setting and the characters make this a very fun read. However, I figured out where the evidence was hidden early in the game, which did make the mystery part of the novel less exciting. Nevertheless, there was still plenty of suspense in watching the events unfold. The ending was overall satisfactory but several key questions were never answered and since this is the first book in the series, I don’t know if the unanswered questions are being left for another novel. 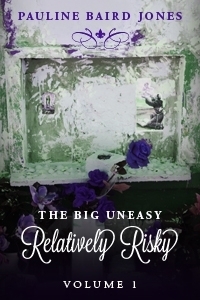 I did learn that there is a short story sequel to this novel, Family Treed: The Big Uneasy 1.5, which I then read and it is fun, but it still does not address a number of loose ends, so I hope that there will be further novels in this series! Readers of romantic suspense novels will certainly not go wrong if they take a trip to New Orleans with Relatively Risky!